‘Stranger than Paradise‘ (1984, dir. 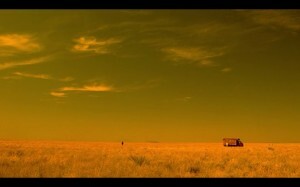 Jim Jarmusch) is a film about desolation and disillusionment. Eva has just arrived in America, and is presumably waiting to be picked up. 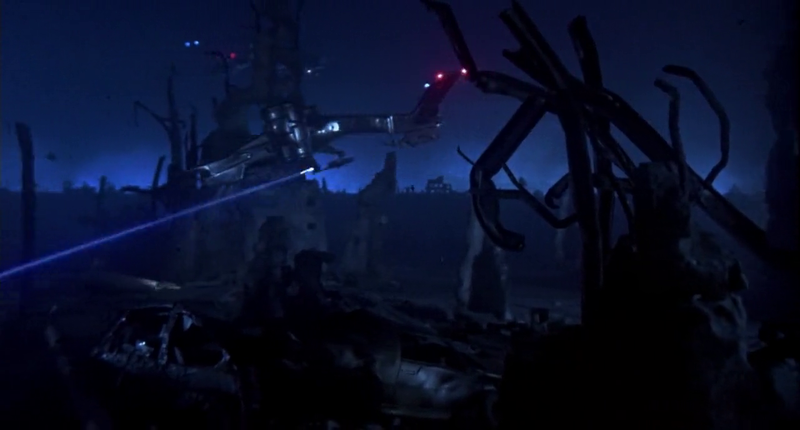 In the opening shot, she’s shown in a static wide shot of a dirt embankment overlooking an airport runway. The composition is devoid of major depth cues: the irregular shapes of the terrain provide no perspective lines or contrast of size that would indicate depth, and the black and white image is inherently devoid of color depth cues. Other than the size of the airplanes indicating that the runway is in the deep background, there are no other visual hints about the geography. The light and dark values are also absent of any information: the terrain and sky create alternating bands of light and dark values criss-crossing the image, creating a disorienting texture. The net result of the lack of depth cues is that Eva becomes lost in a sea of graphic ambiguity, giving a sense of disorientation. The foreground of the composition is dominated by featureless dirt. The only source of visual excitement in the frame comes from the movement of the planes in the background. However, Eva, who is graphically entrenched in the ambiguity of the foreground, feels disjointed from the activity of the background. This introduces her new reality in America: complete and utter desolation. While I am still working on long form posts, much of my time has been monopolized working on several film projects. In the interim, I wanted to share some shorter form thoughts on a more regular basis. The result of this is the first Killer Opening Shots entry. 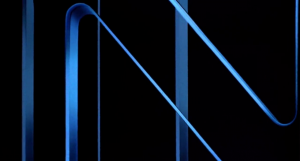 Opening shots are of paramount importance because they’re the gateways to the story. They’re the first taste of the themes and tone of the film, and sometimes are a critical tool in characterization. A well made film can accomplish more storytelling in the opening shot than a poor one can in its opening scene. 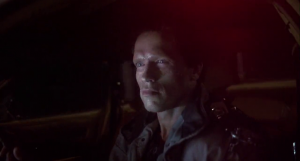 The opening shot of Terminator 2 is a wide shot of cars slowly flowing down a crowded freeway. 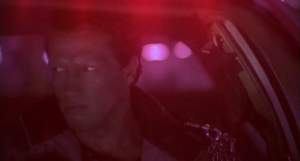 It would be easy to dismiss this as a generic shot of traffic, but there are several specific decisions made with the lighting and composition of this shot to subtly introduce one of the main themes of the film. The shot is composed such that the sea of the cars extends past all four sides of the frame, creating an boundless current of vehicles that gives a sense of an unyielding force. 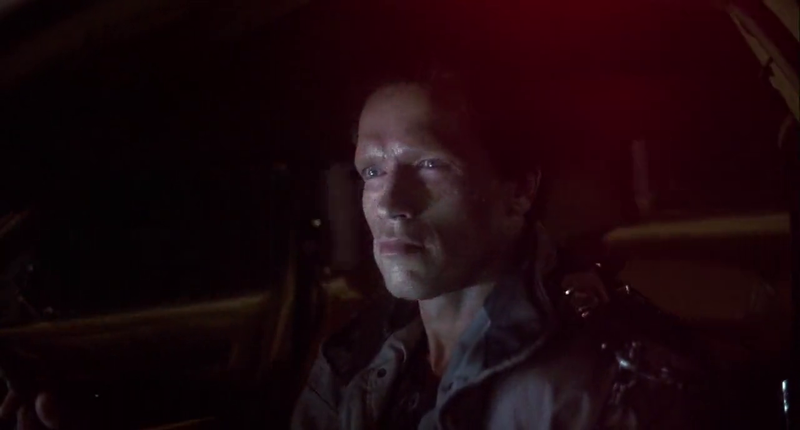 The desaturated color palette, combined with the repetition of similar car shapes is reminiscent of a legion of identical, chrome plated Terminators (the complete success of this opening shot arguably relies on a previous viewing of the first installment of the franchise). The specular reflections of the sun on the backlit cars create sharp, blue-ringed specular reflections on each car, also reminiscent of the specular reflections from the Terminator’s chrome skulls. 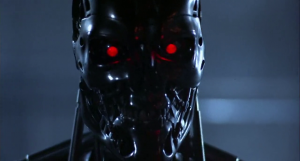 The net effect of the shot is a visual comparison of an advancing column of cars (humanity in the present) with an unyielding, endless army of Terminators (the coming demise of humanity), creating a visual metaphor the human race’s futile march forward to its downfall at the hands of the machines that it created. It’s a subtle introduction of one of the key themes of the film: fate versus free will. For a shot of traffic, it’s really doing a lot of storytelling. 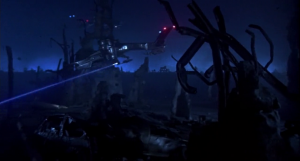 Space Invasion III from Cinevenger on Vimeo. 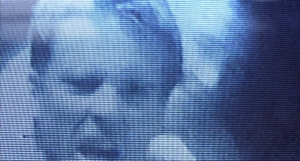 After she enters the apartment, Lisbeth is shown in close-up with Bjurman out of focus in the background. Depicting Bjurman defocused and small in Lisbeth’s background gives the sense that she is no longer intimidated by him, and that he isn’t even her main concern (on a second viewing of the scene, it becomes clear that she is in fact more concerned with checking the house for other occupants than by Bjurman himself). 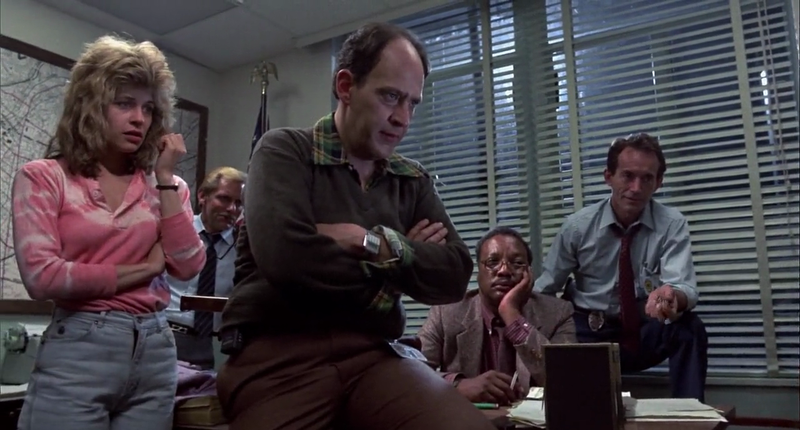 When Lisbeth turns and the lens racks to Bjurman, the juxtaposition of sizes is maintained. The inclusion of the entirety of the large black nebulous void created by the back of Lisbeth’s hooded head in such close graphical proximity to Bjurman makes her seem ambiguously threatening. Opening the scene this way is also particularly meaningful when contrasted to the first scene between these two characters, which used a similar juxtaposition of size and focus to portray Lisbeth’s disconnect and relative helplessness. 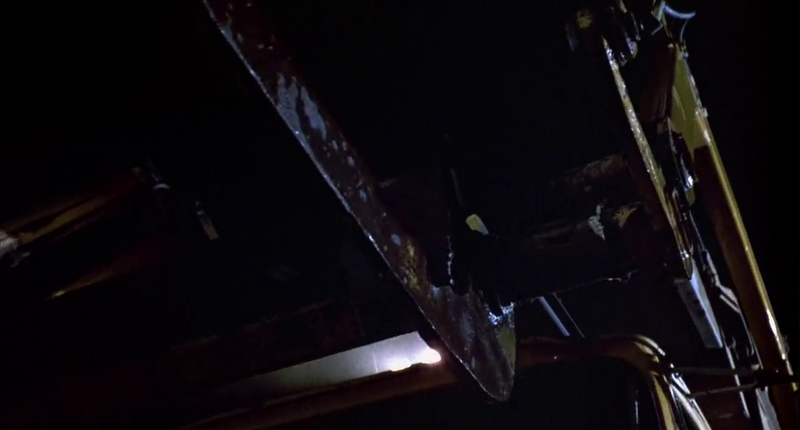 An overhead wide shot looking straight down on a collapsed Bjurman is piece of classic film grammar: the camera looms over him from dominating heights and shows his subjugation. But, it’s more than that: center-punching Bjurman and showing the entire room in symmetrical, straight-on geometry gives a sense of order and meticulousness to the entire incident: it wasn’t a frantic or frenzied attack, but rather something precise and structured. In a medium close-up of Blomkvist, a bright flare stretches across the frame like a beacon, giving the sense of exploration and discovery. In a film characterized by its dark and controlled images, this flare momentarily breaks through the subdued palette and heralds a turning point in the film. A set of shots of Blomkvist operating the computer are more than just inserts: as Blomkvist begins to realize the importance of a set of photos that he is viewing, the series of shots get progressively tighter and the depth of field decreases dramatically. Unimportant visual elements are progressively discarded to a sea of defocus, leaving only the most critical details in razor-thin depth-of-field, giving the sense that Blomkvist is honing in on something substantial. The camera dollies in towards the bedroom door, following the mess of clothes and debris in the dark hallway towards the warm lamplight within. The camera move pulls the viewer out of the darkness and towards the entrance, as if inviting them to creep into a space now seen as secure and safe. Also notable is the contrast between this shot and a shot in the second Lisbeth/Bjurman scene (which was not covered here). In this shot (second image above), the camera looks up at the intimidating doorway and dollies away, as if trying to escape the horrors inside. The two shots, examined as a pair, show the transformation of the space from something abhorrent to pacified. In two medium shots, a blown-out lamp dominates the entire image, reaching across the frame with a scalding flare and creating a razor-sharp specular reflection off Bjurman’s exposed flesh. The light seems to envelop Bjurman like a glowing fireball, showing his raw vulnerability to this vicious situation. Also notable is the connection between the previous scene of Blomkvist’s discovery and this scene, via the use of flare as motif. The conjoining idea seems to be one of catharsis and progress: in both scenes, the flare punches through the image, both leading Blomkvist to a critical break in the case, and ushering in Lisbeth’s vengeance and the resolution to her entanglements with Bjurman. In the reverse angle, Lisbeth is shown in a low angle: a classic film grammar expression for their newly re-calibrated power dynamic. Also notable is the unbalanced and aggressive diagonal angles of the background, centered on Lisbeth, giving the sense of both her antagonism and potential lack of mental stability. As Bjurman is forced to watch a video of his crimes, a new set of angles is introduced: Bjurman’s body stretches symmetrically over the entire frame of these center-punched shots, showing his imminent compulsion to view this new and devastating evidence. In a wide shot, a bright doorway draws graphic attention away from Lisbeth, who sits partially obscured by foreground elements and in relative darkness on the opposite side of the frame. This shift of graphic focus away from Lisbeth gives a sense of her emotional retreat from the pain caused by the video. Lisbeth’s arms float across the foreground and effortlessly obscure a graphically minuscule Bjurman, giving a sense of her new-found ability to forcibly manipulate him. With a beat change in the scene, a new set of high angles is introduced. These shots extend visual ideas previously introduced in the scene to new extremes: Lisbeth’s large ominous silhouette obscures a relatively inconsequential Bjurman, portraying her as a powerful sinister force able to monopolize and manipulate. A medium shot of Bjurman in takes previous ideas to new extremes as a way of displaying the extent of Lisbeth’s new power to dominate Bjurman. In this shot, Lisbeth’s silhouette does more than obscure Bjurman… it cuts him in half graphically, cementing the idea of Lisbeth’s power to shatter him. Lisbeth is then shown in a medium close-up, her physical proximity to the wide-angle lens distorting and enlarging her face. This warped intimacy gives a sense of how Lisbeth has maliciously insinuated herself into the circumstances of Bjurman’s daily life. She will always be there, hovering over him, watching. A dolly-out from the doorway bookends the scene. It deliberately mirrors the previous dolly-in, this time leaving the room behind, and giving a sense of finalization and closure to the Lisbeth / Bjurman relationship. Next time, I will start examining some of the Academy Award nominated films from last year. For now, did anyone anything else of visual interest in these scenes? What’s your interpretation of the hallway dolly shots that bookend the scene? 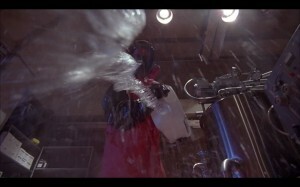 Space Invasion II from Cinevenger on Vimeo. (password is ‘cinevenger’). 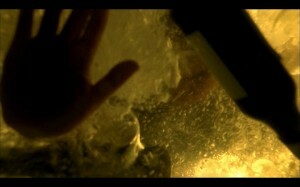 The scene opens with a dolly shot emerging from inside a tunnel. The camera slowly creeps out of the darkness, giving the sense of a predator emerging from its lair, and setting the tone for the following scene. A dolly shot moves backwards down the hall, tracking Lisbeth. The center-punched and symmetrical composition, combined with the camera retreating backwards with her movement, show Lisbeth’s confidence and control. As Lisbeth peers into Bjurman’s office, the darkness on either side of the frame (specifically the large silhouette directly on axis with Lisbeth’s eyeline), give the sense of peering into an ominous cave. We are given a hint that despite her initial confidence, Lisbeth may be the prey in the predatory relationship hinted at in the establishing shot. The beginning of the scene falls into relatively normalized “coverage.” Falling into expected coverage in this case is itself a storytelling device: it’s giving the sense that Lisbeth and Bjurman’s relationship, though tenuous, is still within the expected parameters. The geometric symmetry of the background of Bjurman’s medium wide shot also lends itself to this sense of structure. Another nice touch is the inclusion of the family photo in the foreground of Lisbeth’s medium close shot, advancing the sense of normalization by visually correlating Lisbeth with Bjurman’s own presumably affable relationships, suggesting that the same kinship could be extended to her. The first indicator of a change in the relationship is subtle: in a cut returning back to Lisbeth’s medium wide shot, Bjurman, who previously only had a very small defocused “bite” of his shoulder in Lisbeth’s composition, now takes up a full half of the frame. The increase in Bjurman’s graphic weight and encroachment into Lisbeth’s compositional space gives the sense of him breaking past the boundaries of their previously ‘normalized’ relationship. Also now obscured is the family photo, smothering the previous feelings of potential kinship. 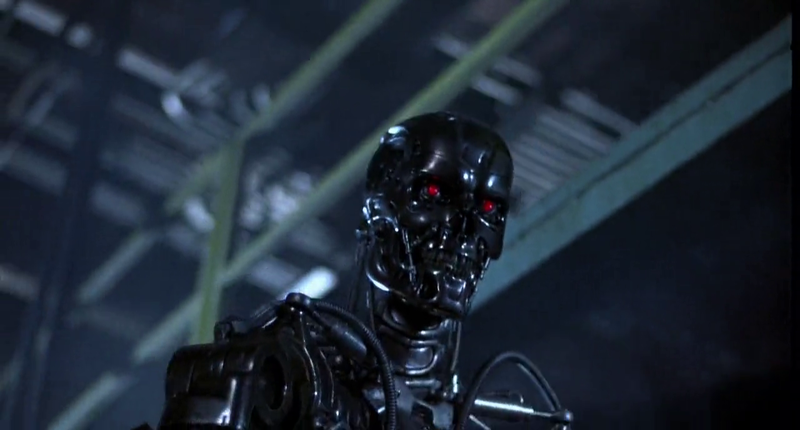 When Bjurman stands to cross the desk to Lisbeth, the camera pans with his midsection, refusing to tilt up to his face, visually depicting his purely corporeal ambitions. In the reverse angle, as Bjurman approaches Lisbeth, his silhouetted form engulfs her, introducing a new sense of voraciousness and hinting that their relationship has morphed into something menacing. A close-up focused on the back of Lisbeth’s head with Bjurman out of focus in the background gives the sense that her attention is not on him, but rather herself. She has completely disconnected from the situation. Lisbeth’s earring (a shape reminiscent of her dragon tattoo), is featured prominently in the frame, and gives a clue that her focus is already on vengeance (an equation to be taken at face value for now… the film’s symbolic equation of the dragon to vengeance is something which perhaps requires its own analysis) . This is an idea that comes full circle by the end of the scene (and is explored below). In this wide, low-angle shot, Bjurman is shown center-punched, with the perspective lines from the cabinets and photos all converging on him. This supreme focus of compositional and graphic attention on Bjurman shows that this act is one of pure egomaniacal self-aggrandization for him. The added obstruction of Lisbeth by the chair in the foreground minimizes her graphic presence in the frame, and furthers the idea that for Bjurman, Lisbeth is just an unimportant object in the theater of his own self-centered pleasure. Also interesting to note is that the final shots of the scene are exclusively subjective to Bjurman. His objectification of Lisbeth has gone to the extent that he has actually robbed her of her subjective point-of-view within the narrative. This is the complete reversal of the confident and authoritative Lisbeth seen in her own center-punched composition at the beginning of the scene. 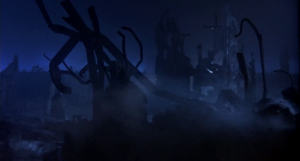 In the final shot of the scene, Bjurman is shown in an overhead close-up, with Lisbeth and the rest of the room barely visible on the edges of the frame, giving the sense that he has ascended past the realm of the physical into a lofty, omnipotent place of his own. However, the upside-down composition twists this sense of loftiness into perversion. 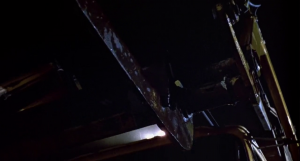 In a subsequent scene, a high-angle dolly shot swoops in over Lisbeth and cranes over her head, settling into an inverted composition similar to the previous composition of Bjurman. The camera movement seems magnetized to Lisbeth, giving the sense of a forced repossession of control. The final composition, mirroring Bjurman’s previous omnipotent composition, hints at Lisbeth’s own plans to force a reversal of her relationship with Bjurman. More about “The Girl with the Dragon Tattoo” coming soon. If you enjoyed this article or want to add to the commentary, please leave a comment and/or Tweet / FB / Digg it! 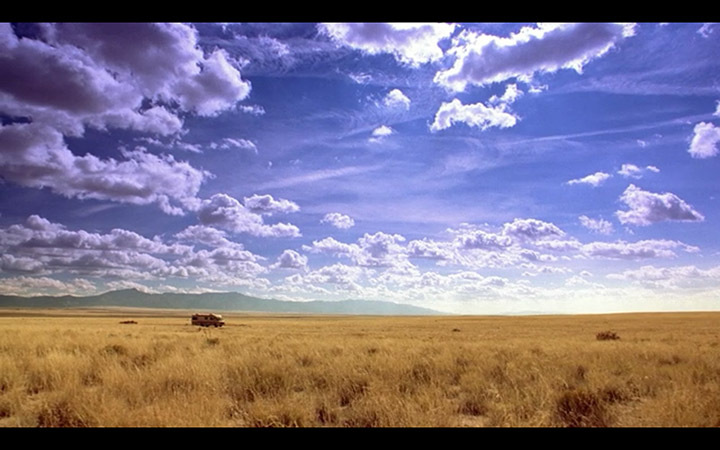 This follows ‘Part 1′ of my ‘Breaking Bad’ analysis, which focused on the lighting. 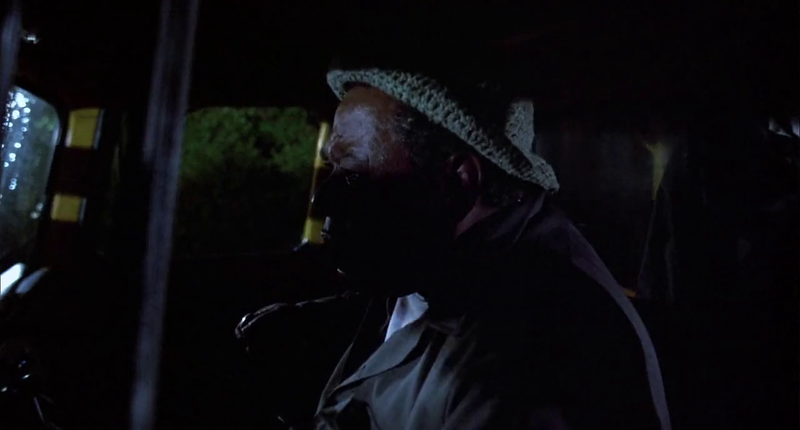 In the scene immediately preceding this one, The Cousins waited for Walt in his bedroom while he showered, intent on killing him when he emerged. Mike contacts Gus to call off the Cousins, leading Walt to unknowingly avoid death, left only with a small clue of their presence by the mysterious displacement of the toy eyeball. The main compositional feature in this image is the perspective lines created by the hallway which all converge on Walt standing in the doorway. These lines pointed at Walt from all sides give the sense that he has been targeted and is vulnerable. Simultaneously, the contrast of value, from the bright room at the end of the hall, versus the dark shapes of the hallway, give the sense that Walt is surrounded by unknown dangers. This is accentuated by the contrast of size (created by the wideness of the lens, which disproportionately accentuates the size of close objects versus far objects). 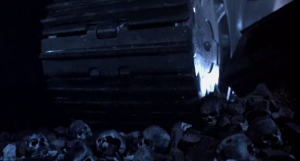 Walt is dwarfed by the dark shapes that surround him, making him seem trivial compared to the danger he faces. 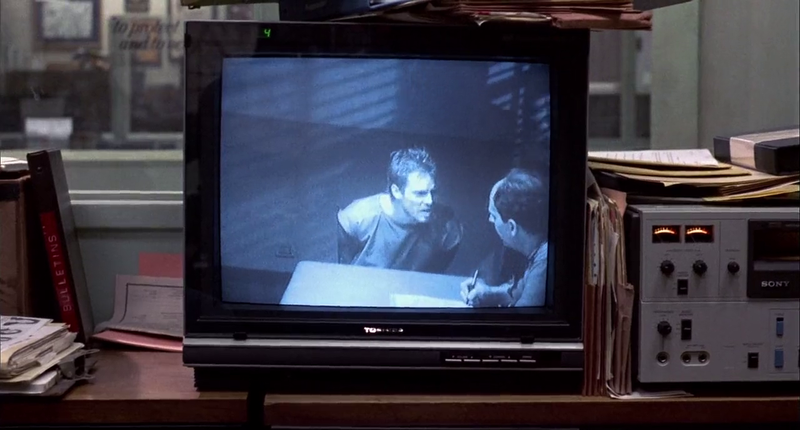 In this scene, Walt and Gale are bonding at the end of their first day. Walt is simultaneously concerned about Gale’s origins, concerned that he may be training Gale as his own eventual replacement. The symmetry of the composition, accentuated by the pair of matching blue tray stacks, draws a comparison between Walt and Gale, giving a sense of similarity between them. However, the other compositional elements seek to portray comparison negatively by visualizing Walt’s fears: the geometric silhouette that surrounds them constricts them to the center of the frame, tightly boxing them in, giving a sense of claustrophobia, and introducing the idea that the lab may not be big enough for the two of them. This is reinforced by the silhouette between them, which divides their similar backgrounds, seemingly putting them at odds with each other. In this scene, Skyler, who has been cheating on Walt with Ted Beneke, is beginning to feel that her affair with Ted feels cold and artificial in contrast to her relationship with her family, despite her hostility towards Walt. The shot starts with Skyler and Walt Jr. on one side, and then dollies over to the symmetric composition seen in the second image above. Walt then stands and removes Holly from a cradle, partially obscured by the pillar. 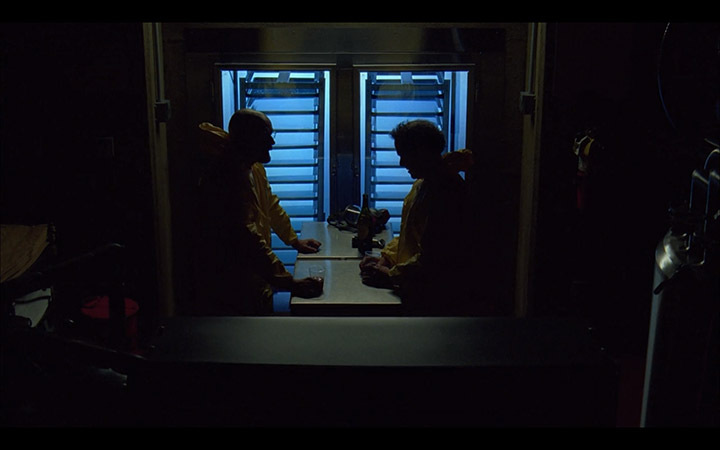 The use of large column of negative space to divide Walt and Skyler compositionally in the frame is an easily evident way to show them at odds with each other. However, the shot goes deeper: in the initial composition, the negative space pushes Walt off to the side of the frame to accommodate the the larger piece occupied by Skyler and Walt Jr, giving a sense of Walt’s growing exclusion from his family. 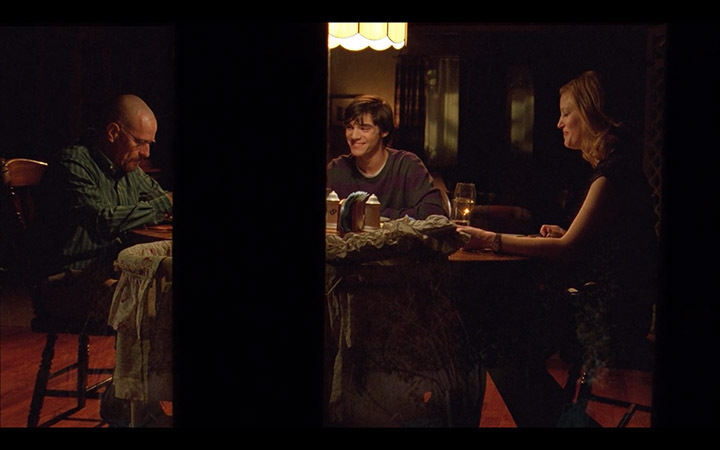 Once Walt Jr. has exited, the camera dollies over and settles into a symmetric composition, brutally divided by negative space from the pillar, portraying Walt and Skyler now as even forces in the callous battle over their family. Skyler then asks Walt if he would like to take Holly. He then leans into the negative space and pulls the previously obscured Holly from the cradle. As Holly emerges from the negative space into Walt’s side of the frame gives the sense of movement from Skylers side to Walt’s: an olive branch extended from Skyler to Walt. This is a shot I looked at last time from a purely lighting perspective, but it’s also working on a compositional level. 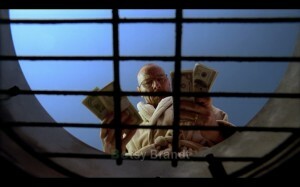 In this scene, Walt is attempting to convince Skyler that they should take the money he’s made, put his criminal past behind them, and move forward with their lives together. In this composition, a bright hallway dominates the background of the shot, the distant converging perspective lines holding the potential of a withdrawal from the conflict of the foreground. The bag of money, the literal representation of Walt’s criminal acts, sits immobile, centered between both them and the hallway. The sum of these compositional elements gives the sense that Walt’s actions are an insurmountable obstacle to the two of them escaping the present and moving forward together. 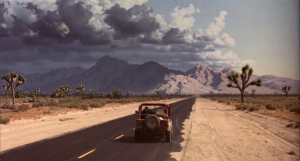 In the previous article, I mentioned my belief that the wide exterior shots in ‘Breaking Bad’ were some of the most memorable images in the series. They work to portray the characters as minuscule relative to their environments, and to reveal the desolate expanse around them. This sense of isolation is used for very basic and straightforward storytelling purposes: In the first image above, the massive barren expanse dwarfs the RV, and informs the audience as to the extremes Walt and Jesse have gone to get away from civilization in order to safely perform their cook. In the second image, part of a scene in which the Cousins execute an entire truck full of immigrants, the empty expanse fills the entire frame, revealing their extreme isolation, which in turn gives the audience a sense of helplessness as they realize that there’s no chance of outside observation or interference with the brutal and mechanical execution. Another recurring feature are unrealistic angles that place the camera inside non-existent surfaces. Materials (such as the blood and other liquids seen above) interacting with this ‘impossible camera’ draw attention to the cameras presence, accomplishing a sense of surrealism. This seems to serve the tone of the show rather than a specific story goal. The shots draw attention to themselves and give an outlandish and fantastic feel to the series, adding a sprinkle of graphic imagery reminiscent of a comic book. This helps paint a world that could be plausibly inhabited by such super-villains as Gus and the Cousins. Another great contributor to this feel is the color palette, which I will examine on the next installment. 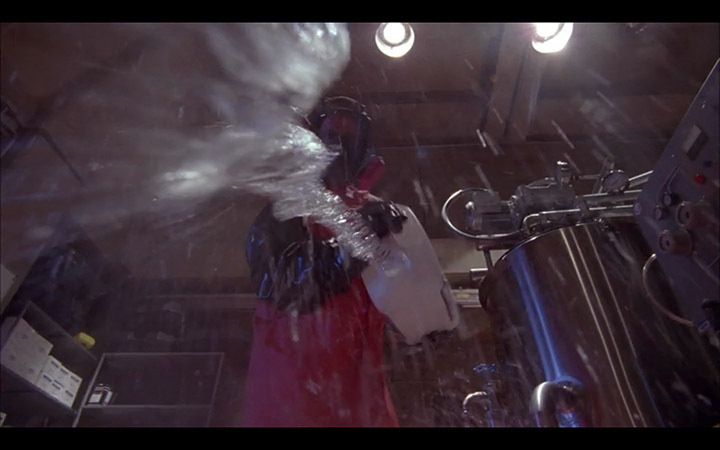 ‘Breaking Bad’ is filled with great master shots, and with five seasons, it’s impossible to find all of them… maybe not even all of the best ones. If you know of an excellent master shot that deserves attention, please post post a link! 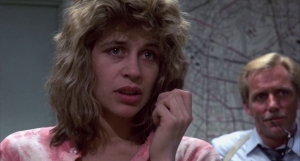 One of the disadvantages of examining an entire television series is the ability to miss great gems. “Punch Drunk Love” (2002, directed by P.T. Anderson and photographed by Robert Elswit, ASC) is a case where every aspect of the filmmaking is calibrated to tell the same story. 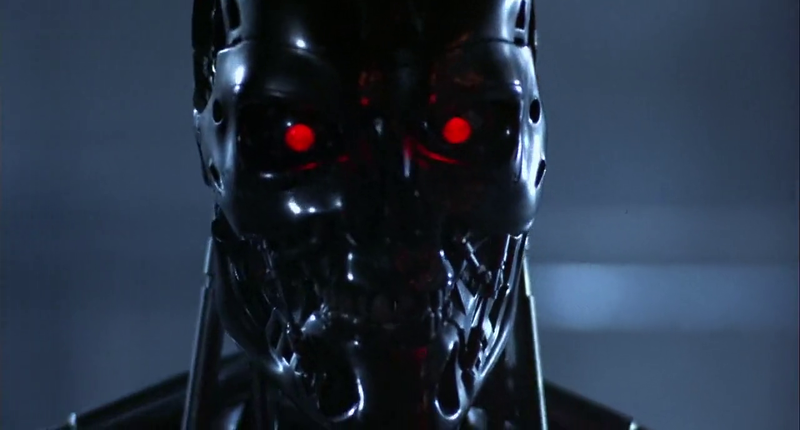 A substantial amount has been written about the visual design of this film, especially since many of the techniques are unsubtle and very easy to isolate and identify (principally the extremely limited color palette of the costume and production design). Most of the analysis I read didn’t go very deep into the camera and lighting decisions, which is what I will attempt to do here. However, these decisions don’t exist in a vacuum (i.e. many of the compositional choices are firmly interlinked with production design ones), so the analysis can’t be totally exclusive. The first shot of the film goes to great lengths to characterize Barry Egan. Showing him in an extreme wide shot in wardrobe that matches the color of the background gives the sense that he is comfortable receding into the environment, camouflaging himself in order to not stand out. This is an immediate hint at his anti-social personality. Shortsighting Barry in the corner of the room gives the sense that he lives a confined and restrained life. The deep shadows on the top and right of frame contribute to this by constricting the frame even more, which also equates the idea of Barry’s comfort zone as a cave-like prison that he has constructed for himself. As Barry crosses frame, the camera pans with him and enters a completely black void, which is finally perforated by the door opening. It’s as if Barry has left one world, travelled through infinite space, and entered another. It’s this first shot that introduces the idea of Barry’s safety cave and the exterior as two different domains. The camera follows Barry out the door and pans left, an important camera move that will be used again several times to construct a fundamental web of meaning that sets the rest of the film in motion. 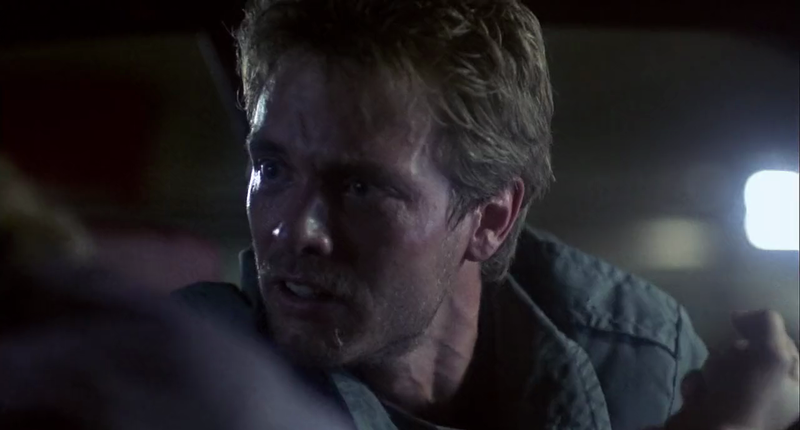 In the second shot of the sequence, the camera slowly dollies in through the gate and then pans left and witnesses a violent car crash. 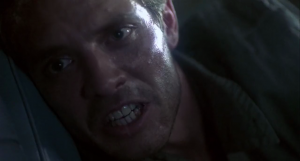 The similarity to the previous shot (a dolly through a portal) is not a coincidence… it presents the visual idea that Barry taking small subsequent steps out of his comfort zone (from the safety of his office cave, to the alley, and finally to the street) can have violent and anxiety ridden consequences. After the harmonium is dropped off, the camera slowly dollies in to a close-up. This is a continuation of a visual motif: the previous dolly move ended with a violent crash, and this one ends with the harmonium, drawing a comparison between the two. In drawing the camera out to the street, far out of Barry’s comfort zone, the harmonium almost seems to taunt him with the prospect of more violence, causing him to retreat. The subsequent medium wide shot of Barry is significant in its differentiation from the opening shot. By contrast, this shot expresses how the previous incident has resulted in a new vulnerability: Barry is now centerpunched, unable to hide off to the side of the frame as he did in the first shot. The image is brighter, without the sculpted shadows of the opening, diminishing the previously established cavernous sense of the space. The distortion of the image also contributes to a sense of exposure: the background seems to bend away from him, pushing him forward into the uncomfortable spotlight. Finally, the harsh lines of the background visually penetrate his head, adding a sense of looming violence to an otherwise banal moment. A giant flare penetrates the lens, giving a sense of the overbearing anxiety and fear that comes with leaving the safety of the cave, and contextualizing Barry’s conversation with Lena as something that is panicked. 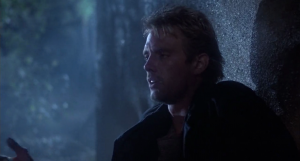 The end result (as before with the harmonium) is a retreat back to his refuge, in this case shown as a deeply shaded corner that masks Barry’s identity in silhouette, camouflaging himself again into the background in an attempt to return to the safe environment depicted in the opening shot. Once Barry musters up the courage to go retrieve the harmonium from the street, he is shown confronting it in a series of extreme wide shots from three different angles. This is the visual antithesis of Barry’s safe cavern: He is literally shown being exposed from all directions, supremely vulnerable to violence from all sides. 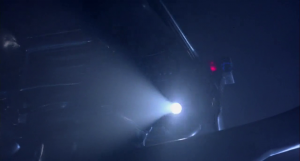 As Barry scrambles back to the safety cave with the harmonium, Lena’s car is placed compositionally in the foreground, equating Barry’s rescue of the harmonium with her, and working to further the thematic ties between the two. We see a series of shots of Barry retreating back to his cave with the harmonium. Significant about these shots is the lighting: hot hits of bright light break up the dark frame, and reflections flare the lens. This gives a sense of the violence and anxiety of the exterior penetrating the safety of Barry’s cave, and shows the great risk he has taken bringing the harmonium inside. In this way, it’s really the visuals that begin to define the metaphor of the harmonium: it simultaneously represents both Barry’s need to confront his social anxiety, and also the amount of fear and discomfort that comes with taking even the smallest steps. Finally, as Barry opens the harmonium, a golden light washes over his face, combined with a slow push-in. We see the payoff to his great discomfort: the possibility that bringing this foreign object (the harmonium, and later, Lena) into the safety of his cave could introduce something beautiful and wonderful into his life. 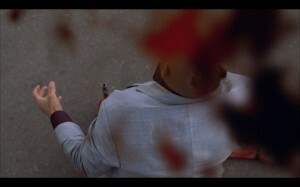 The harmonium has already been equated visually to both Lena and the violent car crash by creating an association between them with similar camera moves. Lena, the car crash, and the harmonium are now intertwined parts of the succinctly stated visual equation of this opening sequence: that Barry will cautiously step out of the comfort of his cavern and risk violent consequences for the chance of discovering love. A side note about this shot, from a larger picture perspective of the film as a whole: in an already incredibly subjective sequence, this is perhaps the most subjective shot, as the light is used to personify emotion in a way completely unmotivated by anything realistic. 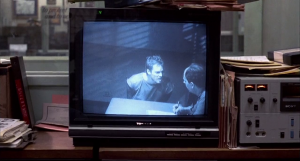 A gamble is being made by the filmmakers that by this point, the audience will be invested enough into Barry’s personal struggle (and entrenched enough in the visual architecture used to portray it) that they will simply accept this moment as a natural and realistic part of the previously established visual grammar. In a series of quick cuts, Barry’s intimate moment with the harmonium is violently disrupted. Blown-out sunlight invades the previously established safety of the dark cave. This is a continuation of the previously constructed metaphor for the harmonium: the fear that letting something new and potentially wonderful (the harmonium/Lena) from the anxiety-ridden world (wide/vulnerable spaces, penetrating flares, and blown out light) into his safety zone (the dark, cavernous office) will have violent and destructive consequences (the opening car crash, and later in the film, the car crash with Lena). The scene where Logan receives the orders from the city computer to find Sanctuary is probably the best photographed scene in the film. When Logan enters the room, it’s business as usual… he is there to receive basic orders as he always does. By the time he leaves, his world is turned upside down. 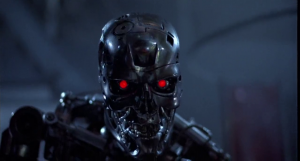 Years have been taken off his life clock, and he has been forced into a mission that he doesn’t entirely understand, and certainly doesn’t want to perform. In the opening of the scene, the room is lit high-key and feels comfortable. The master shot is compositionally balanced, making Logan feel grounded and in control. Compare this with the final shot of the scene, where Logan exits… the comfortable lighting has been replaced with a hard, contrasty light, and the angle is low and distorted, showing the newly twisted relationship between Logan and the mastermind computer that runs the city. The super-saturated lights are framed above him, pushing him awkwardly low in the frame, and diminishing his power in favor of the machine. There’s a nice touch at the end of the scene: after Logan leaves the frame, the camera pushes in on the red light above Logan’s head, seemingly pulled in and manipulated by the computer’s power the same way Logan has been. 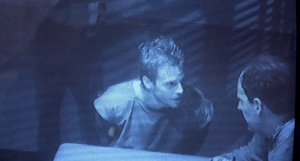 Another subtle progression comes with the shots of Logan as he is given the mission by the computer. 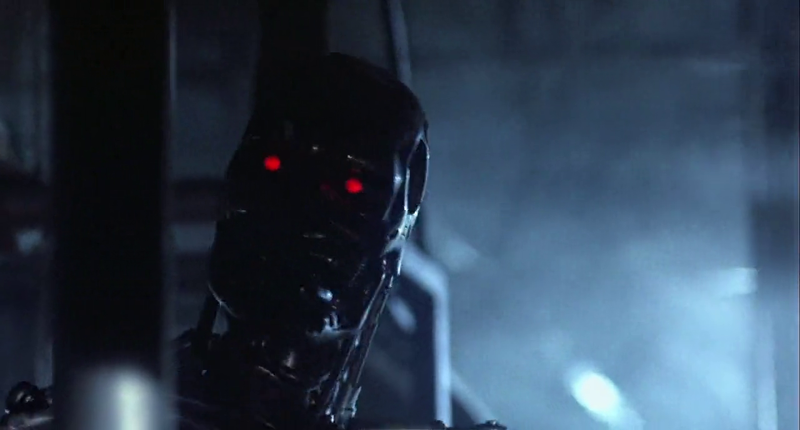 The first closeup below accompanies the “comfortable” master prior to the new mission. As Logan receives his orders, the camera dollys in from an ultra wide to a medium lose-up, the first of this type of dramatic push-in in the entire film, which shows how this unexpected order from the computer has forced an immediacy into his otherwise banal life. A few shots later, we see a new version of the close-up. It’s tighter than the previous one, and it’s the closest we’ve been to him in the entire film. The shallower depth-of-field and lower angle flattens him against the mechanical background, destroying the previous sense of comfort, and showing how he feels that he has been pushed into a corner and manipulated by the computer. A pulsing red light (motivated by his now expiring life-clock implanted in his hand) adds an extra touch of disruption to the previously serene environment.